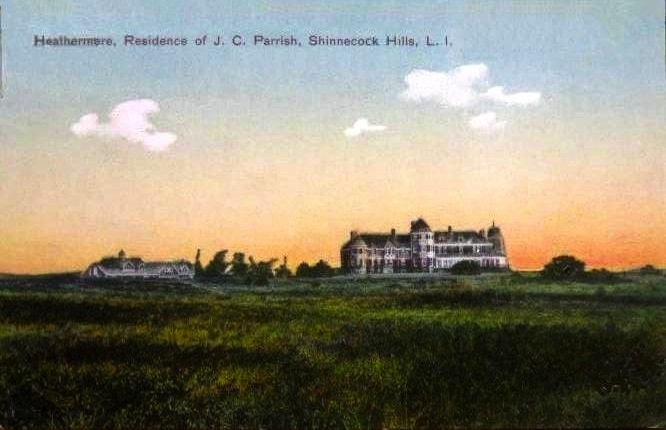 'Heathermere', the James Cresson Parrish Jr. estate built sometime in the early 20th century in the Shinnecock Hills in Southampton. 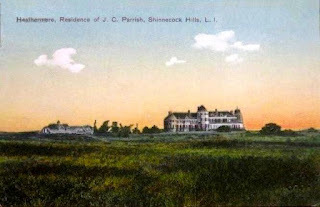 Parrish was an attorney whose uncle Samuel Longstreth Parrish founded the Parrish Art Museum. His father, J.C. Parrish Sr., had a Grosvenor Atterbury designed house on First Neck Lane which is still extant. 'Heathermere' has since been demolished. The sky reminds me of the final scene from "Gone With The Wind;" the grassy field reminds me of Andrew Wyeth's "Christina's World;" the house reminds me I don't want to get on a ladder to clean windows. 'Heathermere' must have been a nice place to get away from it all. Parrish's mother, Emma, was the daughter of William Knapp Thorn and Emily Almira Vanderbilt. That makes today's happy householder the great-grandson of The Commodore. NEW FOR 2012, this initiative,which has received considerable praise from participants and the media, provides exclusive access to private gardens in the Hamptons, Chicago, Newport, Sonoma and elsewhere, and opportunities to hear directly from the landscape architects and their patrons about the design process. Patronage and partnerships have yielded great gardens, from Vanderbilt and Olmsted at Biltmore, Bliss and Farrand at Dumbarton Oaks, to the Millers and Dan Kiley in Columbus, Indiana. Over three separate weekends this spring and summer at more than a dozen sites, landscape architects and their clients will provide insights into how they work together to create today’s masterworks. Parrish Jr. was also the brother-in-law of Archibald Brown of Peabody, Wilson & Brown. Looking at Zach's information on 'Heathermere' again I note that we do not know when it was built, exactly where it was, or when it was demolished; so other than this colorized card do we know 'Heathermere' actually existed? I'm just thinking aloud that photo shopping ain't a new invention, that's all. We know it existed because it's Parrish's summer address in the July 1918 Social Register (Dilatory Domiciles). LOL, I'll say it again -- you can't buy the kind of research that shows up here nearly every day; my thanks to Ancient & Zach. I'll be careful what & whom I challenge in the future.